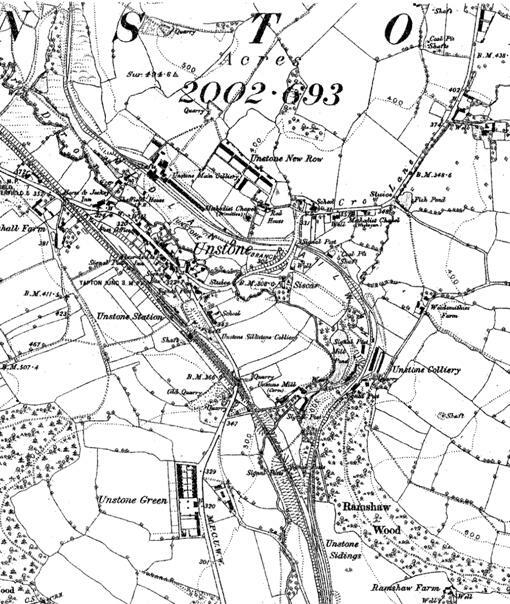 Dronfield & Unstone Collieries. SK 36/37. Fullswood ? May be one of the two above. Railway Bill Head. Glynn Waite. 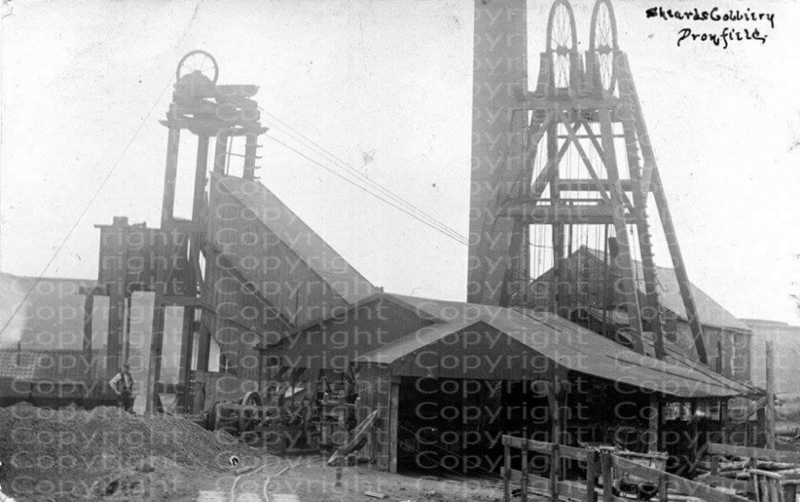 Sheards Colliery (Possibly Sheards Gosforth Colliery) Photograph Copyright. Robert Gratton. John Sheard owner from 1874-1881. Good workmen steady in their attendance to work may meet with constant employment. Apply to Spurr and Hunter Barns colliery Stubley Dronfield. Men accustomed to the Blackshale bed preferred. Engine tenter wanted accustomed to work a winding colliery engine may meet with employment on application to Spurr and Hunter Barnes colliery Stubley. Accident at Bull Close Colliery. 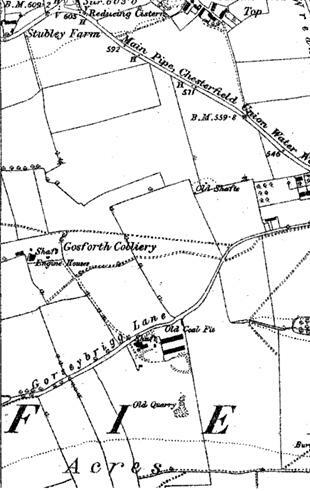 On Friday morning an accident happened at Bull Close colliery to a man named George Booker a miner in the pit who had brought a wagon of coal to the bottom of the shaft. Whilst there the cage was being raised and the wagon thereon 'tipped' striking Booker on the head and chest inflicting serious injury and laying bare the skull in a frightful manner. Boiler Explosion at Bull Close Colliery. On Monday a steam boiler connected with the engine used for raising coal at a colliery belonging to Mr. J.L. Hewitt at Bull Close Colliery Dronfield exploded doing a considerable amount of damage and placed the lives of several men in great jeopardy. The damage is estimated at between £250/£300 beside the stopping of the pit for several weeks which will throw a considerable number of men idle. Colliery and Plant to be Sold. 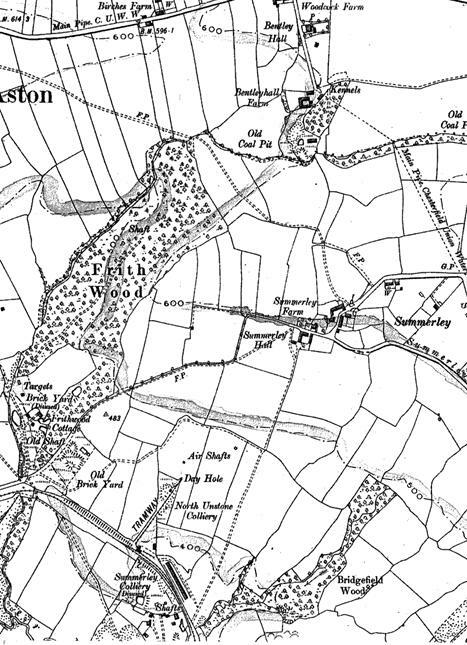 Bull Close Colliery and Farm Dronfield, under an execution from the Sheriff of Derbyshire re William Hewitt. John Turner and Son will sell by auction on the premises of William Hewitt colliery proprietor and farmer the whole of the fixed and loose colliery plant. Horizontal winding engine eighteen inch stroke with fly wheel and four feet metal drum, donkey engine to feed boilers. Headstocks with two pulley wheels four feet in diameter, two winding ropes, two pit cages, pit bank weighing machine by Hodgson and Stead of Manchester, cart weighing machine by Pooley, two coal tipplers, two coal screens. Sale commences 10:00am. Bull Close is about one mile from Unstone and Dronfield stations. Colliery Plant for Sale at New Bull Close Colliery. For sale all the colliery plant comprising of, 5 horse power vertical engine boiler combined with injector, drum and clutch gear complete. The pit is about 1 mile from Dronfield station. Dronfield Silkstone Coal Company; Winding up Order. Davis and Shoesmith have received instructions from the Official Liquidator to sell by auction the loose plant and machinery etc. Hallowes sinking pit portable steam engine and boiler combined. The new and old collieries at Gosforth horizontal steam engine 14 inch cylinder. Two spare winding drums 10 foot and 8 foot. Two winding drums for flat ropes and spur wheels, pit wagons or corves, round and square slack wagons, 1,300 pit props, set of haulage gear by Olivers Chesterfield, 20,000 common bricks, wagon tippler. The Dronfield Silkstone Colliery Company. In the Chancery Division the Master of the Rolls had before him a claim in the winding up of the company to £1,138 by the owners of the Somerville Colliery which adjoins that worked by the company. The claim to recover damages to that amount in respect of wrongful working beyond the boundary alleged to have taken place in 1878. Dispute at Dronfield Silkstone Colliery owned by the Unstone Coal and Coke Company. On Monday a dispute between the above company and the men in their employ at the Dronfield Silkstone pit again came up before the Eckington magistrates. It will be remembered that there has been friction between the manager Mr. R.J. Barnes because Mr. Barnes would not let the men leave the pit when they liked by walking up the engine plain when the engine was at work. Fallswood Colliery October 31st 1863. Wanted a number of colliers at this colliery. Steady men will meet with constant employment. Messrs. W. Jackson and Sons have opened a new colliery called the Grass Croft colliery. It is situated about 1 1/4 miles from Dronfield on the road leading from Dronfield Hill Top to Barlow. Mr. Siddall begs to announce that he has received instructions from Messrs. William Booker to sell by auction at the above colliery on Monday 9th May the whole of the working plant and materials. One horizontal engine of 30 horsepower. Diameter of flywheel 11 feet 6 inches. Winding drum 6 feet. 56 coal wagons, headgear and 250 yards of pitch pine conductors. Mr. G. Siddall has been favoured with instructions from Mr. William W. Barker who has finished his colliery to sell by auction on Monday 27th December the valuable colliery plant, Horses and other effects. Winding and headgear, ten; four hundredweight corves, six tons of wrought iron, bridge rails, weighing machine, four carts, bellows and coke barrels and also a peach mare 13 1/2 hands, brown horse 15 1/2 hands, brown mare seven years old 15 hands, brown mare eight years old 16 hands. Sale to commence at 1:00pm at Dronfield on December 27th. 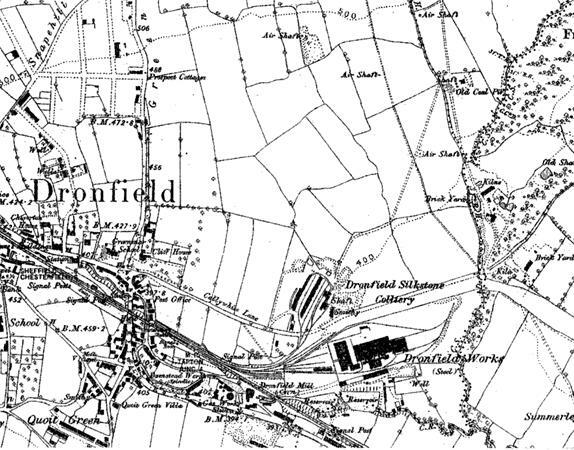 Offence against the Coal Mines Act at Dronfield. On Monday at Dronfield petty sessions George Hoggart colliery manager Dronfield was summoned by H.M. Inspector of Mines for an offence against the Coal Mines Act 1887 'by failing to produce an adequate amount of ventilation for the safety of the persons working in the mine' at Hill Top Dronfield on 18th December. The defendant was manager and part owner of Hill Top Colliery Dronfield. The mine used two shafts to get to the workings and they are some distance from the shafts. The ventilation on 18th December was passing down one shaft and instead of going into the workings it went right out of the other shaft. On that day the manager's brother went into the workings and found that a certain amount of choke gas or carbonic acid existed. He informed his brother but nothing was done by the manager to remedy the matter that day and on the following day the pit was allowed to remain precisely in the same condition. On the 20th a man named Hurst went into the pit and the defendant informed him not to go into the workings of the mine as he knew the choke gas still existed. When the defendant became aware of the choke gas all he had got to do was put up a brattice cloth and instead of the air passing down one shaft and up the other it would have diverted it and sent it into the workings and cleared away the gas. Although the defendant did not go into the workings for some unknown cause the man did, the result being that he was overcome by the damp and fell down and died. After the brattice had been put up the ventilation was rendered complete in 3/4 of an hour. They were then able to secure the body of the deceased. The defendant was manager and part owner with three other men. There were only six men employed altogether. The colliery was now closed and the defendant along with his partners had lost all their money to the extent of £60 and they would now have to go and work in the pits as they were practically penniless. The colliery was opened in 1889 and was being filled up. The owners had paid all the expenses of the deceased man. The object of the Coal Mines Act was to protect life and the defendant had neglected his duties very likely like other small owners did in the neighbourhood and he hoped that this case would act as a warning to those who undertook to work small collieries and impress upon them the fact that life must be properly protected. He was fined £10 plus costs. Mysterious Death at the Colliery. A shocking and some what mysterious death occurred at the above colliery owned by Messrs. Bainbridge and Company Dronfield. A man named John Marples of about 50 a native of Apperknowle was found lying dead at the bottom of the pumping shaft a distance of about 85 yards. 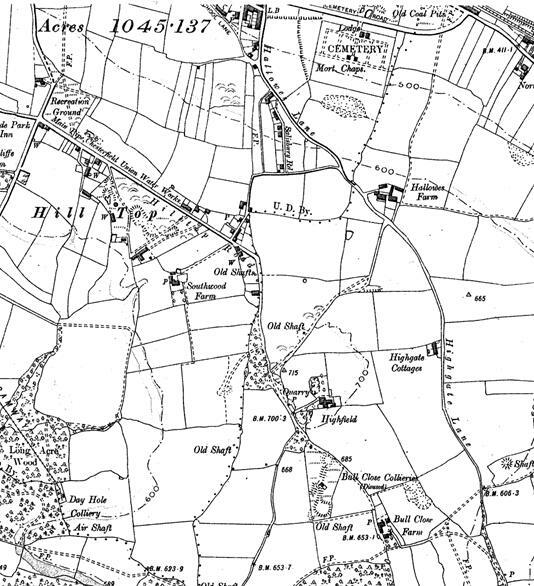 May have been one of several collieries in this area but a Mickley colliery was sunk in 1906. Another New Colliery for Dronfield. Another new colliery, one of two new shafts of a new colliery has just been commenced by Messrs. Andrew Badger and Sons on land called the Riddins about quarter of a mile south west of the town. The coal is that of the Silkstone bed. Mr. W.A. Badger colliery proprietor Dronfield charged Thomas Jackson collier of using threatening language towards him at the pit. Mr. Badger said Jackson was a violent man and threatened to smash his head in. The defendant applied for his wages of 25/- but Mr. Badger took his ticket and tore it up. Mr. Badger was to pay the wages and Mr. Jackson the costs. To be sold by auction upon the premises of Messrs. Swindell and Salt Sloads colliery, complete gearing for the working of two pits, three new pit ropes, and ten corves. Shafts at least 193 feet deep. Coke ovens. SK 36967 78063. Thomas Gascoyne one of the proprietors of the above colliery died from injuries caused by falling down the pit. Frederick Gascoyne identified the body as that of his brother aged 47 at the inquest held at the Green Dragon Inn. To be sold by auction the colliery plant, 6 horse power haulage engine with drum, vertical boilers, Cornish pumping engine, cart weighing machine up to six tons. 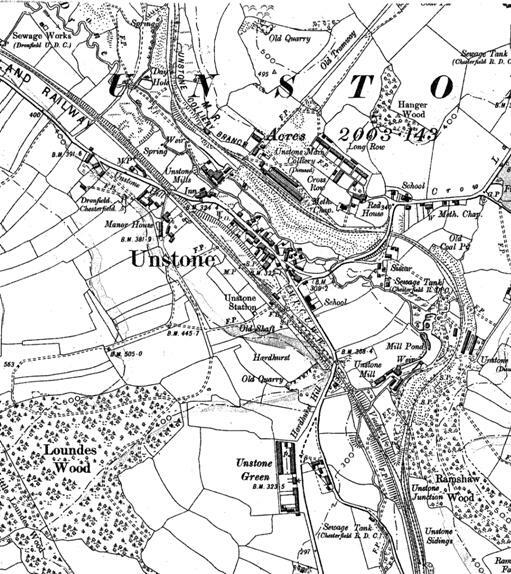 The colliery is situated within 1/2 mile of Unstone station. Unstone Ironworks set up in 1848 by the local coalmaster Walter Rangley.